#770 AXP ElastaHyde reflects over 83% of Sun’s rays and serves as a thermal reflector due to hiding & reflective pigments but is not recommended as the finish coating. It is recommended that #720 ARC or #790 AFC ElastaHyde be used as the finish coating over the #770 AXP ElastaHyde. When cured #770 AXP ElastaHyde forms an extremely tough, flexible film that can withstand the most rigorous weather conditions. When reinforced it forms a complete waterproof membrane. This coating is designed as a base coating for smooth mod. bit., asphalt emulsion and our “Fluid Applied Reinforced Roofing” membranes. #770 AXP ElastaHyde may also be used as a base coat on conventional built-up, foam and metal roof systems. 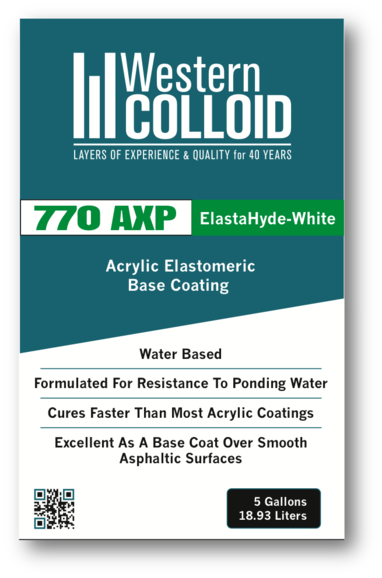 Western Colloid’s #770 AXP ElastaHyde is a 100% acrylic, premium quality, high durability, elastomeric coating which has been developed as a base coat to protect smooth APP Modified Bitumen and various roof surfaces. This product was designed to adhere to smooth APP Modified Bitumen and other asphalt products. Because of its design and adhesive characteristics it performs extremely well under ponding conditions as a base coat. It can be used with polyester reinforcements to create an extremely tough and durable roof membrane. Reinforced coating system is FM Approved. Use as a basecoat for #720 ARC and #790 AFC ElastaHyde. Formulated for uses with smooth, modified bitumen and ponding surfaces.